What is Nata De Coco? Nata de Coco comes from Spanish, meaning "cream of coconut". It is a coconut-based dessert that is categorised under the health food segment of canned desserts. Nata de Coco is LOW IN CALORIES, has NO CHOLESTEROL and HIGH IN DIETARY FIBER which is good for digestive system. Our canned Nata de Coco is free from artificial colouring or preservatives. 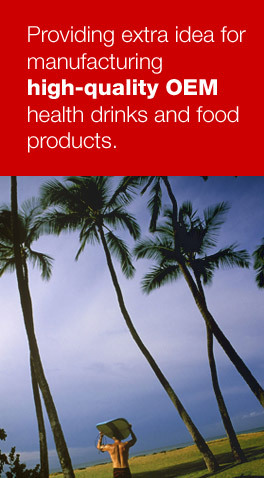 It is produced by the bacterial fermentation using coconut water and other natural nutrients. How to recognize a good quality Nata De Coco ? A good quality Nata De Coco has high fiber spongy flesh and slightly hard. If it is being pressed by finger, it can become as thin as paper and it is hard to tear off due to its high fiber content. How to make Nata De Coco taste better? High fiber Nata De Coco itself is without any taste. In order to make it tastier, you can mix with any drinks especially fruit juices or flavored drink. What are the benefits for regular consumption of Nata De Coco ? Nata De Coco is very good for our digestive system especially for those who faced constipation problem. It helps to clean our intestines and prevent constipation. Many studies showed that regular consumption of Nata De Coco helps to protect against bowel cancer and has potential to prevent atherosclerosis and coronary thrombosis. In many Asian countries such as Japan, Taiwan, Indonesia and Singapore, Nata De Coco has become their daily dessert after meal. It is suitable for elderly and young children.